If you've been following our vineyard news for a while, you will know that we love having bees on the vineyard. Our cluster of hives house around half a million bees, all looked after by our bee-farmer Sergio. Sergio extracts our Albury Honey for us, and now makes our very own Surrey Hills Mead! Mead, a delicious 'wine' fermented from honey, is said to be one of the world's oldest alcoholic drinks. Revered for its healing properties since ancient times, this time honoured tipple is the 'nectar of the gods' according to Celtic legend. During medieval wedding ceremonies, newlywed coupes were given enough of this golden liquid to last one full moon, to encourage fertility and vitality in their marriage, and ensure a child was born within a year, hence the term ﻿honeymoon. And it seems this ancient drink is now making a fashionable comeback! According to recent news articles, sales of mead have tripled since the popular TV series Game of Thrones, which is set in the 15th century and features the drink, first aired in 2011. 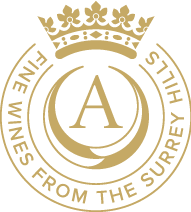 Rich and floral with heady honey aromas, Surrey Hills Mead can be served chilled over ice, with a twist of lemon, or simply poured at room temperature to let the honey flavours shine through. Buy your bottle here. Love bees? Sergio is running a series of bee-keeping demonstrations at the vineyard this year - find out more.